This marathon on paper looked a good one. Was easy we thought. Fly to Valencia and then catch a train to Castellon to check into hotel and visit expo on the first day. Course seemed flat and weather was looking good for that weekend. Of course when you travelling with Pete Morris, Martin (Bushy) Bush, Dean Allaway, Caroline Jackson & Caroline Hargreaves well things don’t always go to plan and truth be known I wouldn’t have it any other way. I do enjoy a bit of chaos but sometimes it does have its limits. All seemed to be going smoothly until we got on the flight at Gatwick. A text and then a phone call came through from Dean saying he’d lost his passport. This happened somewhere between bag security and passport control. He eventually found it but he was too late for the flight and decided he would go home. We were one man down which was a shame. Time was tight as we’d booked the tickets. Now was just a simple case of grabbing the train to Castellon. Did I say simple? Wrong!! 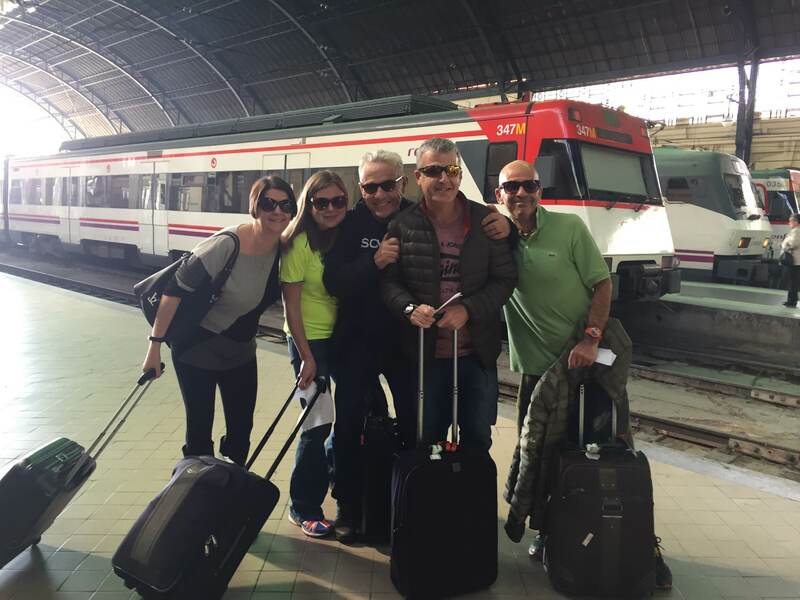 We got the right train OK but Caroline J thought Castello de la Plana train station said something else so we quickly dived back on the train. It was still moving and poor Bushy was running after it and eventually jumped on. Magnets and tacky souvenirs where strewn over the track, but luckily Bushy was in one piece. But wait, we were at the right stop and now ended up 8 miles away at next station called Benicassim. What the hell we thought and grabbed a few photos did a #TeamJackMon video and caught next train back to Castello de la Plana. We’d not even got to the expo yet. We did eventually get to our hotel and soon after made our way to the expo. It was at Ribalta Park where we would finish the race. I was immediately impressed and couldn’t wait to start the race. If you’ve ever been to a race expo you’ll know that all kinds of foreign races are advertised so we tend to spend a bit of time at them. The guy from the Porto marathon stand was giving out free port so he tended to be our best friend for the day (Yes Caroline & I are now doing that marathon). A few photo shoots holding up our numbers and passports (Sorry Dean but it had to be done J ) and it was time to get back to hotel. Sandy Sheppard and Brian Kirsopp would arrive later so we picked up their bags in advance. Race morning came and what a great morning it was. Sandy & Brian’s hotel was right next to the start so we joined them for coffee before a mass RR photoshoot near a bull statue. Fireworks & music blasted at the start which gave it a party feel. This was a good course and well supported, I recommend it to anyone. €35 and they even threw in a tech t-shirt. We find these races cheaper all around than the UK all in all and we get a holiday out of it. 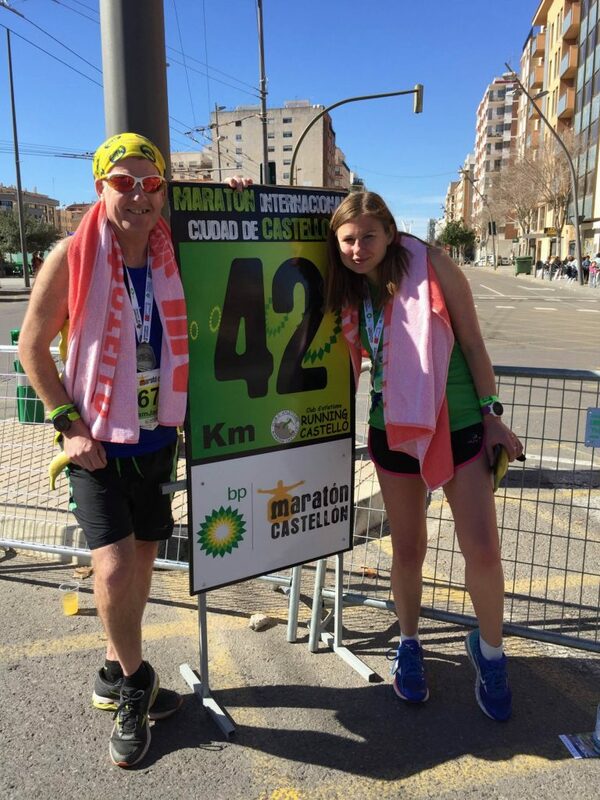 I did struggle on this one as Caroline & I hadn’t ran a marathon for 7 weeks so I did feel rusty even though I’d be training hard for this. I crossed the line at 3:43 were Caroline was waiting for me (she did 3:37) We received a towel and tons of food including pizza at the end. Maureen Sweeney kindly came along to support us adding to the great atmosphere later on in the park at the end of the race. We now waited for the rest. Brian was already in and Sandy was doing the 10k . To our surprise Bushy pulled off a 4:10 his fastest in 6 years. Did he sniff a free souvenir? He told us he didn’t want to miss out on the towel hence his time. Joking aside he’d only done a double marathon the week before and it was about his 11th of the year making it even more impressive. He’d go on to run a 4:06 the following week in Malta.We have so many friends from 100 marathon club etc that it’s like a running family. Much like Roadrunners but an international version. 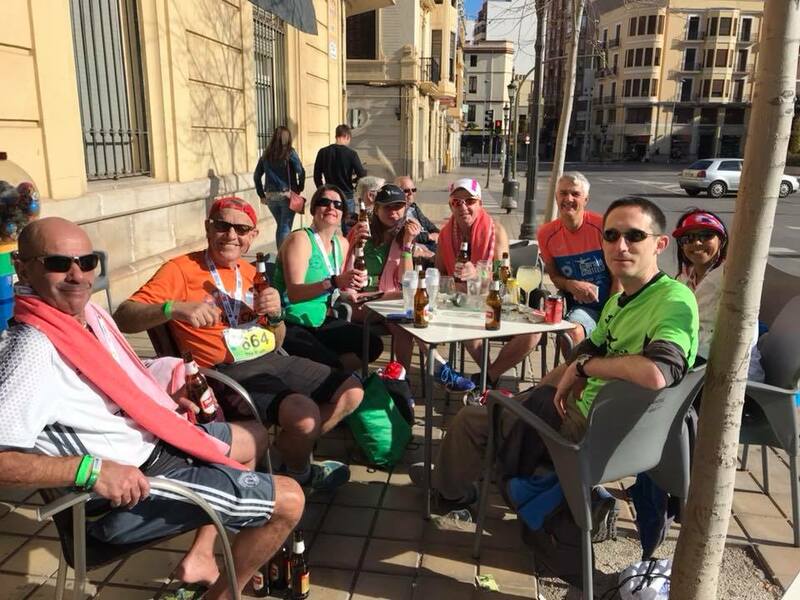 So we all met up near the finish for a few beers in the Spanish sun. Brian got the best time, Pete got the most photos, and Bushy got the most freebies. I can’t recommend this race enough. We were in Castellon a couple more days so had the delight of us all celebrating visiting the various tapas bars. Pete even managed to eat mussels & snails. There’s just so many of these great little local places in Castellon with a distinct lack of tourist traps. We also kind of like it when the menus are in Spanish and they don’t speak much English. 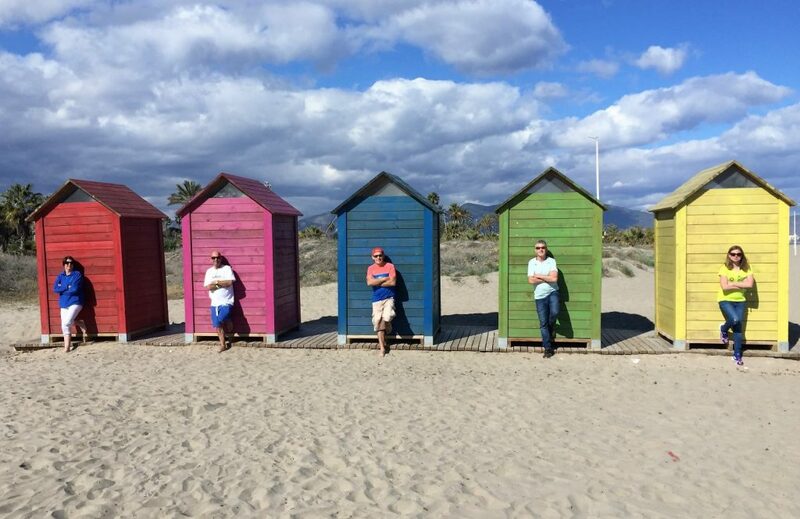 Did I mention there’s a beach at Castellon? We took a bus and about a thousand Spaniards followed us on. I was crushed against a pole which looked like I was pole dancing in the photos. 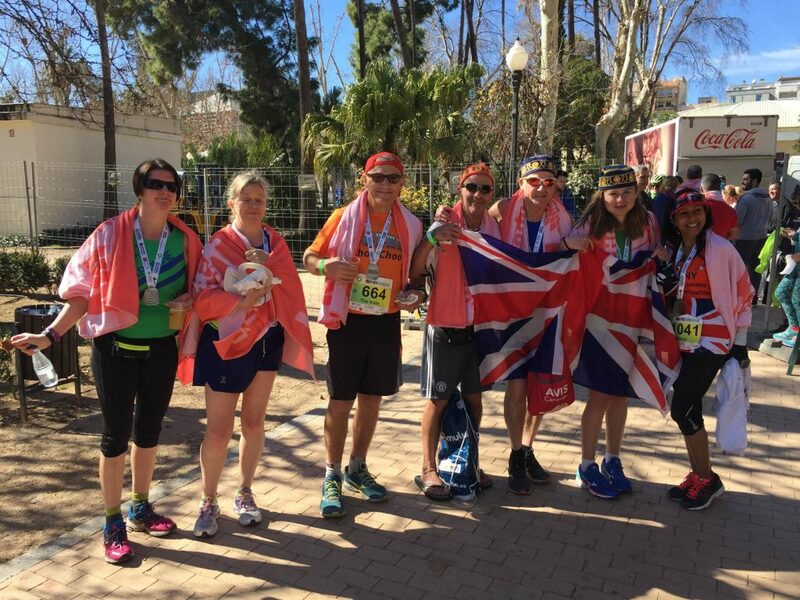 The journey worn me out more than the marathon, and not one person stuffed a €10 note in my stocking.